I'm setting the story in Ottawa, with the three young mages being students at Carleton University. An alumnus myself, I'm familiar with the layout of the campus and of the city. I can figure out where I need to place people, add elements, and conceive of twists that can have far-ranging consequences**. The neighbourhoods the characters live in can be reflective of their backgrounds, too***. Adding the fantastic to Ottawa also allows for a contrast; the city has a reputation for being dull, one that became true as people moved from elsewhere with the mentality. However, Ottawa can party, as anyone who has been to Parliament Hill on Canada Day can attest. Ottawans can be loyal to their sports team, provided the loyalty is returned. The long-defunct Ottawa Rough Riders still had sold-out crowds during their 2-16 season, despite the weather. One tool I use from time to time when doing the preliminary work on a story is The Sims 2. When I'm not sure about a character's appearance, or if I want to play around with an idea, I can fire up the game and create the character and all of his or her attributes. With the camera function built into the game, I can take photos. Guess what I did for the Threefold? Holly lives in Orleans, a suburb of Ottawa. Her parents moved there when she was young, as young families tend to do. I still need to work out Holly's family, but, right now, they have a mini-van and a Prius hybrid. This tells me that Holly has at least one sibling and that either Holly or her sib(s) were active in sports and had to be driven around. The hybrid leads me to say that both parents work or are active, but not in the same area of town. Given that Holly was described last time as a philosophical athiest, she may have had some influence over the choice of the Prius. Holly also buses in to class; post-secondary students automatically have a surcharge added to their student fees that gives them unlimited access to public transit. Holly is taking full advantage. Teri saw Holly as athletic and thus the Warrior, and Holly does keep herself in good shape, participating in several sports through the seasons, including tennis, hockey, and soccer. For her classes, Holly is majoring in Philosophy. Her plan is to go on to post-grad work, though she is realistic enough to know that she needs a fallback plan and is exploring minors. She's in her third year, with a heavy enough writing load for her classes. Holly does have friends from both high school and her classes and even from other majors thanks to first year multi-disciplinary courses. She has seen Miriam around in the halls and tunnels between classes; Astrid spend most of her time in different buildings. There are some details to fill out - Holly's hobbies, preferred foods, preferred computer system****, family. Given what she is like, at least in my head, I can fill those out on the fly if needed. 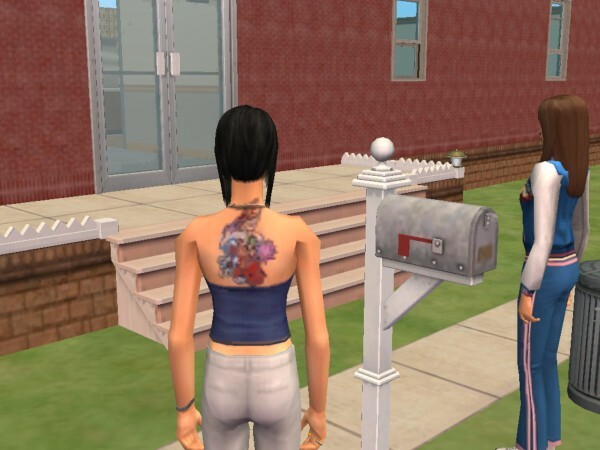 Created in The Sims 2 with the University add-on. I used the fit body type as the base. The top she's wearing is part of the University expansion and includes the tattoo, something I hadn't though of when I started work on her but felt that it would be something Holly would have. Here you can see the tattoo a little better. To Holly's left is Miriam. Holly in both pictures strikes me as being laid back, though not a push-over. Miriam lives in the Glebe, the only neighbourhood in Ottawa to get a "the" in front of it. She lives in the student "ghetto", an area where Carleton students live many to a duplex unit for outrageous rents. This means that Miriam is not native to Ottawa but came from elsewhere. For now, I'll say she's from Northern Ontario; this could change. Miriam is Jewish and does follow relgious strictures as she can. Her devoutness is what leads Teri to believe that Miriam would be the Priestess of the cell. However, Miriam is very common sense, can be blunt when she needs to be, and has studied the more mystical elements of her religion. Miriam has three roommates, again, to be determined. Given that she lives in the Glebe, she either walks to class or grabs a bus. Miriam does have a license; she does not have a car, in part to save on expenses. Fortunately, most places where she wants to go does have easy public transit access, either through the O-Train on campus or the buses that pass through the Glebe. One of her roommates does have a vehicle, which helps with getting groceries and avoiding bad weather. At Carleton, Miriam is in her third year of majoring in Religious Studies. As mentioned above, she has seen Holly in the hallways between classes. Miriam is hoping to use her degree to get a position in a temple, though I do need to research this. She's still adjusting to being in a large crowd after being in Northern Ontario; class sizes were a paradigm shift for her, going from small-ish to hundreds in some of her first year classes. Miriam has lived on campus; her first year, she lived in residence and still keeps in touch with people from the same floor. She's far happier having roommates and her own room, though. Like Holly, I have details to determine with Miriam; her family, her roommates, her hobbies, though, since she's practical, she uses Windows instead of a Mac purely because PCs are cheaper. She's also the most serious of the Threefold, but not humourless. With Miriam, I went for a look that was more pro-Carleton. She has a number of shirts and track pants with the Carleton University logo. Miriam even has a Carleton leather jacket, which is not the same colour as the Sim State jacket pictured+. I used the standard body for Miriam; she doesn't work out as much as Holly, but she's also not a couch potato. Walking to class and walking building to building between classes keeps her trim while she watches her diet. Oh, dear. Astrid has been the one to flag be down for this post.++ In the Threefold, she's the one who will make things happen, just to see what does happen. Astrid lives in Barrhaven, another suburb of Ottawa. Barrhaven has gone through rapid expansion recently; Astrid's family is one of the newcomers, moving there from Ottawa South. Astrid does drive, and carpools to get to class. The carpool avoids her car, a Volkswagen Beetle. Right now, I have no idea what her family is like; Astrid isn't saying. Astrid is a math major at Carleton. In high school, people found her weird because she loved playing with numbers. Most of her classes have her in a different building from Miriam and Holly; Astrid is under the School of Mathematics and Statistics at Carleton, not under the Faculty of Arts and Social Science like Holly and Miriam. Outside class, Astrid is a member of the Carleton Strategy Club where she tries to get people interested in wargames. Outside tuition, Astrid's biggest expense is Warhammer miniatures; she has a decent collection of orc and wood elves; the former for the sheer chaos and the latter for serious games. She also doesn't have a problem using her feminine wiles to distract an opponent. Astrid's wargaming and roleplaying hobbies lead her to become the Warrior, changing the approach from physical to mental, from fighting one-on-one to a tactical approach. Again, there's a lot to determine for Astrid. Her carpool, her classmates, her friends at the club. Computer-wise, she prefers a tablet, going with an Android model. Here, I went with the flabby body in the Sims. Astrid isn't one to exercise unless she has to, and the dichotomy between her shape and her role was too good to pass up. I caught this as the Holly and Miriam sims stared at Astrid. The scene that came to mind was Astrid saying something bizarre and Holly and Miriam just staring at her as a result. This one picture probably nailed down more of Astrid's personality than anything else. As for Teri, she's still in development. * The network needs a name, still. The Network makes it sound more formal and invasive than it really is. ** Sandy Hill and Rockcliffe have numerous embassies and official residences, for example. *** Vanier gets interesting. It goes from low-rent to exclusive; one can walk along a street and see the property values rise with every step. **** Mac, PC, or Linux-based. + For one, Sim State's mascot is the llama, while Carleton's is the raven. ++ I should really add a post about how my characters come about. That's a flabby body? Sims doesn't seem wholly realistic, Astrid looks better than Holly. Though it could also be the skirt and the fact that I'm not big on tattoos. Also, beside the point. Setting things in a location you know also makes sense. I notice none are actually staying on campus though, will there be any sort of centralized place they all tend to meet? Sometimes one of the trickier aspects is figuring out how all the characters can interact on a regular basis. Not that I'm against a math major, plus maybe that's where Teri comes in... either way, the world seems to be coming together, detail and all. I've never thought of my characters in terms of operating systems. The flabbiness shows up a little better with other outfits, like Holly's. I approached the appearances with the idea that each could be attractive, thought probably not to everyone. It does; less research in the middle of a writing sprint when I need to work out a location. None aren't, though Miriam did live in res. She's in the Glebe, which is basically across Bronson from Carleton, so she is the most central. Part of the reason why I worked out vehicles; they'll need to get around somehow. Teri's there specifically to pull them together; she's the mentor, which means that once the Threefold form a proper team, she needs to get life insurance. ,The world is coming together slowly; the urban fantasy elements are forming and the antagonists will have a reason for their activities. The OS choices, like the vehicles, come from the characters. At some point, I'll know what they read, listen to, and watch.